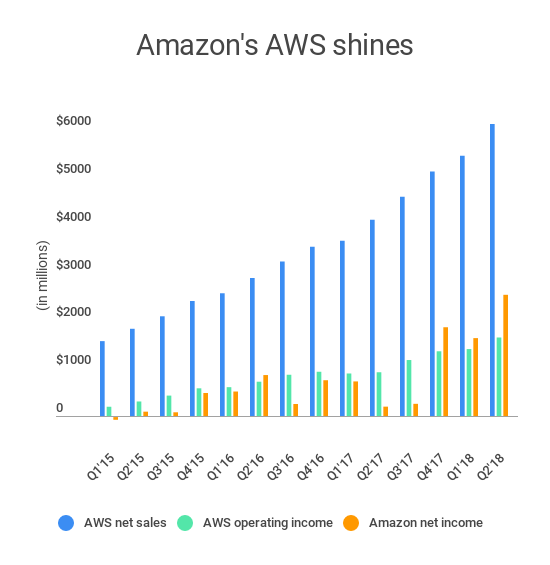 Amazon’s web services AWS continue to be the highlight of the company’s balance sheet, once again showing the kind of growth Amazon is looking for in a new business for the second quarter — especially one that has dramatically better margins than its core retail business. Despite now running a grocery chain, the company’s AWS division — which has an operating margin over 25 percent compared to its tiny margins on retail — grew 49 percent year-over-year in the quarter compared to last year’s second quarter. It’s also up 49 percent year-over-year when comparing the most recent six months to the same period last year. AWS is now on a run rate well north of $10 billion annually, generating more than $6 billion in revenue in the second quarter this year. Meanwhile, Amazon’s retail operations generated nearly $47 billion with a net income of just over $1.3 billion (unaudited). Amazon’s AWS generated $1.6 billion in operating income on its $6.1 billion in revenue. So, in short, Amazon’s dramatically more efficient AWS business is its biggest contributor to its actual net income. The company reported earnings of $5.07 per share, compared to analyst estimates of around $2.50 per share, on revenue of $52.9 billion. That revenue number fell under what investors were looking for, so the stock isn’t really doing anything in after-hours, and Amazon still remains in the race to become a company with a market cap of $1 trillion alongside Google, Apple and Microsoft. This isn’t extremely surprising, as Amazon was one of the original harbingers of the move to a cloud computing-focused world, and, as a result, Microsoft and Google are now chasing it to capture up as much share as possible. While Microsoft doesn’t break out Azure, the company says it’s one of its fastest-growing businesses, and Google’s “other revenue” segment that includes Google Cloud Platform also continues to be one of its fastest-growing divisions. Running a bunch of servers with access to on-demand compute, it turns out, is a pretty efficient business that can account for the very slim margins that Amazon has on the rest of its core business.